One of the major complaints of pain in the shoulder is related to weak rotator cuff muscles. Weak rotators can become strained or torn due to trauma, poor exercise form, chronic over use, or muscle imbalances. The rotator cuff consists of 4 muscles: Supraspinatus, Infraspinatus, Teres Minor, and Subscapularis. 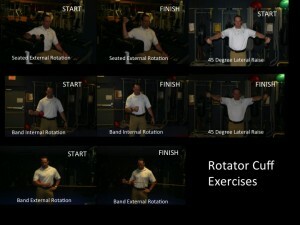 Here are some great exercises to help strengthen the rotator cuff muscles. 1. The SEATED EXTERNAL ROTATION. Sit at a 90 degree bench with arm set at 90 degrees. Bring weight up and down in a smooth consistent pattern. 2. The BAND INTERNAL ROTATION: Place a towel or medicine ball against side of body allowing elbow to be pressed against it. Holding the band at 90 degrees pull the band inward. 3. The BAND EXTERNAL ROTATION: Place a towel or medicine ball against side of body allowing elbow to be pressed against it. Holding the band at 90 degrees pull the band outward. 4. The 45 DEGREE LATERAL RAISE: With a light weight hold dumbbells at a 45 degree angle away from body. Turn thumbs down and raise DB’s up 5-6 inches. If you do suffer from pain in the shoulder and would like to learn more about it I am available for consultations.